WILLIAMSON, W.Va. Ã¢Â€Â” Rosa Jane Heflin, 80, of Williamson, passed away Mon., July 20, 2015, at the Charleston Area Medical Center, Memorial Division, Charleston, W.Va.
Rose was born April 18, 1935, in Scarbro, W.Va., the eldest child and only daughter of the late B. Nelson Burnside and Arizona Aliff Burnside. In addition to her parents she was preceded in death by her husband of 56 years, retired W.Va. State Police Sergeant James E. "Champ" Heflin; two brothers, Ballard Preston Burnside and Hansford Nelson "Pope" Burnside; three brothers-in-law, Eugene Heflin, Bernard Brooks Heflin and Paul Skeeles, and two sisters-in-law, Cora Sue Burnside and Leona Heflin. Rose grew up in a lively home where she was the only sister of four mischievous brothers. She was the oldest of the five and her brothers looked up to her and treated her like a princess. She told her children story after story of her adventures with her brothers. She recalled her father teaching her to drive the family's Ford standard automobile. The boys begged their dad to take them along for the driving lessons. Every time Rose killed the engine or popped the clutch, the boys howled with laughter from the back seat. She said it aggravated her at the time but through the years it had become a favorite memory. She also told the story of her parents purchasing the family's first television and how her brothers loved watching Bandstand on Saturday afternoons. They turned the volume up as loud as possible and danced all over the house while their father threatened to, "Throw that thing out." Rose and each of her brothers were popular among their peers and their home was always filled with friends and cousins who enjoyed one sort of activity or another. Like many Appalachian families of that era, Rose's extended family was large and close. There were lots of cousins, aunts, uncles and friends to share and celebrate life experiences: births, deaths weddings, birthdays and holidays. The Christmas celebration was the most exciting time of the year in the Burnside home. Family came from far and near to join in the festivities. There was plenty of good food. Homemade cakes, pies and candies were abundant and when there was snow on the ground her mom and dad made snow cream for everyone to enjoy. Rose always said that her years of growing up were very good and she had lived a blessed life. She graduated from Kingston High School in 1953 and later moved to Baltimore, Md., where she was employed by Westinghouse. On October 12, 1955, she lost her oldest brother, Ballard, in an automobile accident. Her parents and younger brothers were devastated by the loss and seeing how much they needed her, she returned home for what she thought would be a short time and she would then return to her life Baltimore. It was during this time that she met her future husband, Trooper JE Heflin, a young trooper stationed on the West Virginia Turnpike. She said she took him home to meet the family and they all liked him, "So she kept him." They married in 1958 and moved to Welch where they started their own family. Denise, Jamie, JB and Angela were the sunshine of their parent's lives. Words have not yet been coined to describe the mother that Rose was to her children. During the early years of their lives, she didn't work outside the home. She was always at home at the end of the school day and she listened to each of the children tell her about their day at school. In the spring, just before school dismissed, and the weather was warm, she was usually found at the end of the school day in the back yard, either putting laundry on the clothes line or taking it down. The children had an after school snack and sat outside with her telling her one story after another about who had done what and what grade they got on what test and what book they had to read and so on and so on. She was able to listen to everyone at the same time. When her youngest, Angie, started kindergarten in 1969, she went to work in the Wyoming County School system, at Wyoming Grade School, the same school the children attended. It could not have been a better situation. As the children grew, she was supportive of all of their endeavors and encouraged them always. She was kind, compassionate, sympathetic, patient, deeply caring and understanding. Every once in a while she became a little rattled as the mother of four growing children. An example of that would be the day she dressed JB and Angie for a photograph and they proceeded to go outside and spray one another with a water hose. In her usual easy style she brought them into the house changed their clothes, combed their hair and off they went. Perhaps her greatest legacy as a mother is the life she modeled before her children each and every day just by being who she was. By example she taught them to love one another, to love their extended family, to look upon others with kindness and compassion and that selfishness is not a virtue. Everyone who knew Rose knew what a great sense of humor she had and she imparted that to her children as well. Through all of life's passages she found reason to laugh and smile. The family moved to Williamson in 1973 and Rose became an employee of Mingo County Schools. She said she never really thought of her job as work because she enjoyed it so much. She loved her students and they in turn, loved her. Her co-workers were her family and she enjoyed everyone so much. She retired on June 10, 1997. She was more than a little sad when school started in the fall of that year, but she was happy to have the time to spend with her grandchildren. She adored her grandchildren and would often say, "Every time I look at my grandchildren, my buttons pop!" She loved them so and they her. She became a great-grandmother on December 4, 2014, with the arrival of Charlotte Brooke Weaver. Charlotte had just recently started saying, "Nana," and that made her Nana very happy. 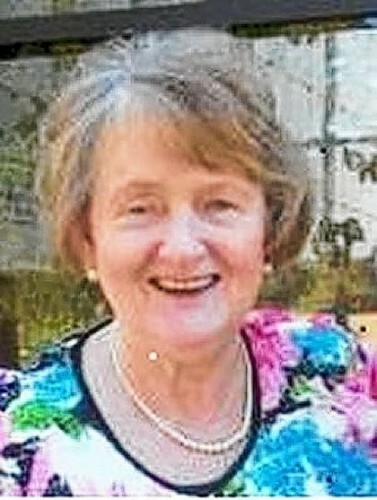 Rose enjoyed her retirement and loved to travel. She always kept a suitcase at the ready as any one of the children might call at a moment's notice to ask if she wanted to go here or there. She was always ready to go whether it was to the Grand Canyon, the Chicago Theater, the Biltmore Estate in Asheville or perhaps her favorite place, the beach. She was always so much fun to be with. Rosa was a beloved child of God and accepted Him as her Savior. She was a former member of the Cooper Memorial Baptist Church and moved her membership to Grace Baptist Temple in 1973. Rose was a beautiful soul who lived a beautiful life. At her death, as it had been throughout her life, she was surrounded by the love of her brothers, her children, her grandchildren, her nieces and nephews and most importantly, the love of the Holy Spirit who gently escorted her home. She will be sorely missed, yet loved and sweetly remembered until we meet again. Rose is survived by four beloved children, Denise Heflin-Peyton of Charleston, Jamie and her husband, John E. Weaver, of Williamson, JB and his wife, Lisa Heflin, of Williamson and Angela and her husband, Mickey McKnight of Thomasville, N.C.; four grandchildren, Daniel Matthew Heflin, a third year law student at the Appalachian School of Law, Grundy, Va., Jonathan James Hampton Weaver, a Charleston City Police officer and his wife, Brittany, of Charleston, Alexis Victoria Brooke Weaver, a senior at West Virginia University, of Morgantown and Grace Lauren Rose Peyton, a freshman at the University of Charleston, of Charleston; a beautiful great-granddaughter who gave her Nana so much joy and happiness, Charlotte Brooke Weaver; two brothers, Douglas and Justin Dale Burnside, both of Scarbro; four sisters-in-law, Delores Heflin, of Weirton, Dora Lee Skeels, of Canton, Ohio, and Mary Lou and her husband, Bill Randolph of Lost Creek and Betty Burnside, Columbus, Ohio. Also surviving are several wonderful nieces and nephews and beloved cousins. Visitation is from 6-9 p.m. Thursday, July 23, at Weaver Mortuary in West Williamson. Funeral services will be conducted at 11 a.m. Friday, July 24, at the mortuary. The Reverend Ron Sanger will officiate. Interment is in Longpoint Cemetery, at Walkersville, Lewis County, W.Va., where she will be laid to rest beside her beloved husband, James, exactly one year after his burial there. Rose's grandsons, sons-in-law and nephews will serve as pallbearers. You may express online condolences to the family at www.weavermortuaryinc.com. Weaver Mortuary of West Williamson is serving the family.